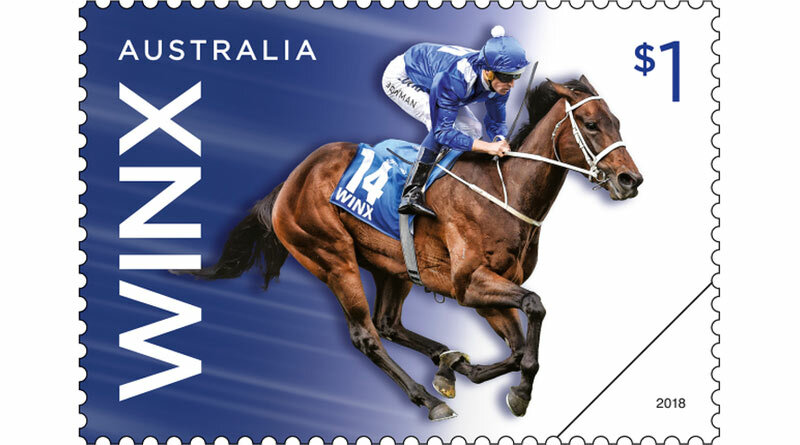 A $1 stamp featuring superstar racemare Winx has been released in Australia to mark her 26th consecutive win. Winx won the race previously known as the Warwick Stakes but renamed the Winx Stakes last year in her honour, on August 18. Her winning streak is a new Australian record, breaking the 25 wins by Black Caviar, and is second worldwide only to the Hungarian mare Kincesm, who won all of her 54 races in the 1870s. The stamp shows Winx in full flight with regular jockey Hugh Bowman during the 2015 Cox Plate – the first of her three successive Cox Plate wins. Australia Post’s Winx release includes a first day cover, maxicard and sheetlet pack, as well as a special 26-win stamp pack and a medallion cover. As well as a first day cover, maxicard and sheetlet pack, the stamp issue will include a special 26-win stamp pack ($A30) and a medallion cover ($A24.95). The medallion is a special “record breaker” design and the special pack includes photographs of each of Winx’s winning races in the stamp tabs. Winx has raced 35 times for 29 wins (including a world-record 18 Group One wins) and three 2nd placings. She has finished out of the placings on just three occasions. She has won over distances from 1100m to 2200m. She is only the second horse in history to win three WS Cox Plates, after Kingston Town. She is the third mare in history to win two WS Cox Plates, after Sunline and Tranquil Star. However, Sunline and Winx are the only two to win the Cox Plate back-to-back. In 2016 and 2017, Winx was nominated as the world’s top-ranked filly or mare and the world’s top-ranked turf horse. In 2017 she was inducted into the Australian Racing Hall of Fame, only the third horse to earn this honour while still in training. On 10 May 2018, Winx was placed at number one in the Longines World’s Best Racehorse Rankings. Winx was bred by Fairway Thoroughbreds and was foaled on 14 September, 2011 at Coolmore Stud, Jerry’s Plains in the Hunter Region of New South Wales. Her sire was Irish-bred stallion Street Cry (1998–2014), the sire of Zenyatta. Winx’s dam is Vegas Showgirl who was bred in New Zealand and by Al Akbar. Winx is owned in partnership by Magic Bloodstock (Manager, Peter Tighe), Debbie Kepitis and Richard Treweeke. She is trained by multiple premiership-winning Sydney trainer Chris Waller.